Just when you think Italian politics couldn’t be more confusing or bizarre, they are. I have no idea what is going to happen now. Maybe we’ll have new elections. The Pope said good-bye yesterday. The city is packed with tourists who came to see him for the last time. Cardinals are flying in for the conclave and there are journalists in town from all over the world. Work-wise, things were hectic. I’m not sure how it’s Friday already. Yesterday, Domenico and I drove up to Tuscany to visit the job site and to meet with our client who flew in from Germany. Normally, we would stay overnight but we decided to make it a day trip and left Rome at 6:30 a.m. It was a very long day. At one point my brain said, “BASTA!” and refused to cooperate. It was around the time I was asking the contractor questions in Italian and then translating his answers into English. On the drive back home, all I could think about was taking a long shower, getting in my PJs, and then watching Law and Order SVU reruns on Fox Crime (I have a thing for Detective Stabler). 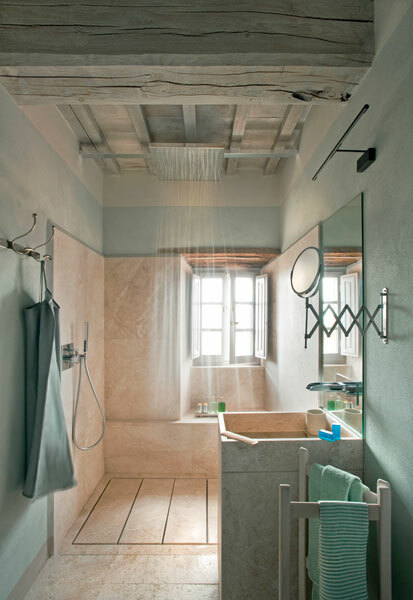 The shower in the photo was designed by Ilaria Miani for Monteverdi. Monteverdi is a group of rental villas and a hotel in the small village of Castiglioncello del Trinoro in Tuscany. Stunning. I hope to check it out sometime later this year. In the meantime, Stabler and I will be relaxing this weekend. Thanks E. My settings have my current Twitter address. Not sure what’s going on! Investigating. Stabler is played by the wonderful actor Christopher Meloni, who also used to be on the HBO show “Oz”. I will have to write an entire post about him but not sure how I would tie it in to design. Hmmm. Yes, the Italian is finally improving. You can tie Stabler into Design by talking about how fine he looks in a suit. And out of a suit. I love Stabler, and was so upset when I heard he had left the series, but I surprisingly don’t miss him from the new episodes. Det Amaro is muy caliente!! mmmm…. I haven’t seen the new episodes yet so I’m not aware of this Det. Amaro!! I used to love Stabler too and I too haven’t seen Amaro yet … must check him out! Not sure why the post-Stabler episodes haven’t aired on SKY yet. Very curious about this Det. Amaro. Next Next post: Weekend Inspiration – A View From Positano.